Tracey Lai with a model of VSQ @ PJ city centre. MALTON Bhd's latest commercial development, VSQ @ PJ City Centre has done pretty well with about 40% of its business suites in one of its five blocks sold within two months of launch despite stiff competition. The freehold project with a gross development value (GDV) of RM207mil has a unique feature: condominium facilities like a swimming pool! Office workers can unwind at the gym, spa or restaurants after a hard day's work at the recreational deck and retail podium that will have F & B outlets. It is also Wi-Fi ready at selected areas. 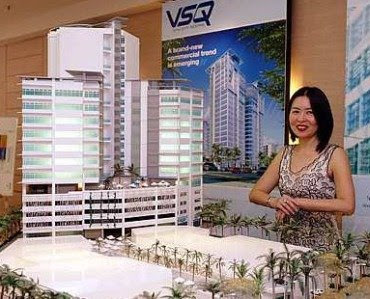 In fact visitors to VSQ (pronounced as V Square) sales gallery at Phileo Damansara 1, may be forgiven for thinking that it is a condominium because a model of the project shows the usual condominium facilities. Some owners might turn some of the business suites into a SOHO (small office, home office) where they can live in it. There are individual suites with pantry and bathroom as well as three-phased wiring for all types of office units. Security is also top-notch with access card system and CCTV cameras. A SOHO may be a good idea especially for single executives who prefer to live and work in the same place and avoid all the traffic jams. With so many eating-places at nearby Section 13 and 14 (Jaya 1, Jaya 33, Three Two Square and Digital Mall) or at the nearby PJ city centre, buyers or their tenants can have their meals outside without any hassle. VSQ on 2.58-acres of leasehold land is in a prominent part of Petaling Jaya (along Jalan Utara), where there are plenty of amenities. It is within walking distance to PJ Hilton, Armada Hotel, Crystal Crown Hotel, Menara Axis and the Asia Jaya LRT station. The Tun Hussein Onn Eye Hospital is next door. However, a minor downside is that Jalan Utara can be quite congested especially during peak after office hours. Fortunately, since it is about 100 metres from the turning into the Federal Highway, it would not be a long wait even if one were caught in a traffic jam. Malton sales & marketing director Tracey Lai said there had been enquiries for the en-bloc purchase of the other four blocks. They are two, 18-storey corporate towers (average RM530 psf/8,388 sq ft per floor) and two, 7-storey corporate offices (average RM483 to RM486 psf or RM12.3mil and RM11.5mil/3,390 to 3,645 sq ft per floor). She said the two corporate towers fronting Jalan Utara would be ideal as corporate head offices while the business suites with 921 sq ft to 1,911 sq ft (average price of RM500psf or RM435,900 to RM872,800) was designed for smaller companies which needed smaller space. Lai's excitement over VSQ is understandable, as the project is perceived to be the new business landmark in Petaling Jaya. This part of Petaling Jaya has experienced “very hot” take up rates for commercial projects over the past three years and the momentum seems to be in full swing. This phenomenon is partly attributed to the pent-up demand for office and retail space after a long absence of such projects in the area. Businesses are also relocating to Petaling Jaya. There is now a boom of commercial projects in the area. Meanwhile, Malton has lined up several high-end projects worth a total GDV of RM2.1bil for this year. They include The Grove, Pearl Villas, and Ukay Spring. It has also soft launched the Amaya Saujana (378 units in three blocks) last November. About 70% of the Phase 1 residential suites had been sold while sales had also been “surprisingly strong” for Phase 2. It will pre-launch the freehold The Grove in SS23, Petaling Jaya next month. It will comprise of 31 bungalows (price from RM3.4mil to RM3.8mil) and four link bungalows (RM3mil). Its target market is a high-income individual above 35 years old and who is looking to upgrade to an exclusive gated community with 24-hour security. It has also done very well for its Pearl Villas at Section 16, Petaling Jaya where all 42 units of three-storey semi-detached houses have been sold. “Many of our purchasers are professionals who bought for their children. As there is a scarcity of freehold land in Section 16, people jumped at the opportunity to buy the Pearl Villas houses priced at an average of RM2.6mil,” she said, adding that it would be very costly for people to buy an old bungalow in Section 16, demolish it and rebuild. The Malton Group (renowned for its three flagship projects, Bukit Rimau, Mutiara Indah and Mutiara Puchong) comprises the Khuan Choo Group, Bukit Rimau Development Sdn Bhd and Domain Group. In 2002, the three were injected into Gadek Capital Bhd, resulting in its re-listing on the main board of Bursa Malaysia and it assumed its present name Malton Bhd. The first batch of three and five-storey MSC-status shop offices sold and completed in i-City in Section 7, Shah Alam, Selangor. Inset is Datuk Lim Kim Hong. AN international information technology (IT) player has described smart-community developer I-Bhd's RM2bil i-City as the “No 1 technology city in Asia”. Office Squared Ltd (a subsidiary of Servcorp) said the proposed i-City was not just a technology park but was also a totally plug-and-play environment, offering true high-speed broadband. Servcorp is the second largest serviced office provider in the world, currently managing over 9,000 clients in 13 countries. Office Squared business development manager David Cross, who is in Kuala Lumpur to attend the 16th World Congress On Information Technology (WCIT) 2008 from May 18 to 22, said i-City is packed with world-class networking technologies, capacity that surpassed today's business needs. “Its facilities and services, geared for the second generation Internet development called Web 2.0 out-performs other Asian technology parks built five or more years ago, thus making it the most advanced technology city in Asia,” he said. He also described i-City as a “one-stop shop” where its advanced business communications were complemented by sophisticated productivity, collaboration and mobility tools that were available online. “Users save capital costs and reduce the cost and resource demands for business operations, while maintaining high speed and high availability services and on-site support. They will enjoy astoundingly fast service implementation and avoid frustration of slow connections, blackouts and Telco disconnections,” he added. I-Bhd chief innovation officer Ricky Lim said there were eight reasons for businesses to choose i-City: It has MSC Malaysia cybercentre status, fibre optics with Cisco network, super broadband with redundancy, Cisco Unified Communications with receptionist, Servcorp powered services, Tier 3+ data centre, 100% backup power supply and a shopping mall. I-Bhd, whose shares are listed on the Bursa Malaysia main board, is showcasing i-City at WCIT 2008. About 2,500 participants from over 80 countries are attending the event billed as the “Olympics of ICT”. The ICT-based i-City commercial township is master planned by world-renowned and award-winning American architect Jon A. Jerde. “We are very pleased that i-City was recently awarded the MSC Malaysia Cybercentre status. The development of this 72-acre freehold ICT-based premier commercial development in Section 7, Shah Alam, is a strategic fit in our corporate plans to make i-City an international world class techno-city using the latest in ICT technology,” said I-Bhd chairman Datuk Lim Kim Hong. Meanwhile, the first batch of 44 units of three and five-storey shop office in i-City have been sold and completed. Another 34 units of similar shop offices will be launched in July or August. The Emkay Group of companies, controlled by developer Tan Sri Mustapha Kamal Abu Bakar, is buying more land in Cyberjaya to continue its investments and focus there. Emkay, which has spent more than RM400 million since 2004 from its coffers for developments at the digital city, is planning to construct buildings under a build-and-lease concept and plan custom-made properties for local and foreign firms. "We may resort to borrowings to finance bigger projects here if we have to. We are planning new housing and commercial projects and will rope in Embassy Group, our Indian partner, in planning them," Mustapha Kamal told Business Times at the official opening of Block A of MKN Embassy TechZone by Ambank Group chairman Tan Sri Azman Hashim in Cyberjaya recently. Also present was Jitendra Virwani, director of Embassy Group of India. TechZone is a 12ha information technology park comprising four hi-tech buildings worth RM350 million, jointly developed by Emkay and Embassy. Another eight blocks would be added by 2011. Emkay has 36.4ha in Cyberjaya that it acquired for RM215 million, which would translate to a gross development value exceeding RM5 billion offering 15.3 million sq ft of office space. Azman, meanwhile, told Business Times that AmBank is happy to support Bumiputera entrepreneurs who are planning large-scale projects that are viable in Cyberjaya. 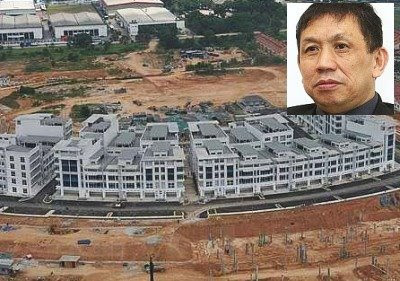 In developing Cyberjaya, which started in 1997, Azman said it (Cyberjaya) would require more companies like the Emkay Group to push developments forward. "Emkay is here to fast-track developments. Their partnership with Embassy proves there is still huge potential at Cyberjaya and AmBank would be happy to support them financially not just for future projects, but existing ones as well," Azman said. Emkay is also building Neo Cyber, Cyberjaya's first integrated development, comprising an 18-storey serviced apartment block, a 10-storey office tower, offices and 15-storey apartment blocks. BSEL Infrastructure Realty Ltd, a builder from India, is investing RM15 billion over 12 years in Iskandar Malaysia. The Mumbai-listed company inked a memorandum of understanding with the Iskandar Regional Development Authority (IRDA) for several development projects, IRDA said in a statement yesterday. It is IRDA's first collaboration with a company from India. BSEL has developed and built hotels, hospitality projects, industrial parks, information technology parks and townships in both India and the United Arab Emirates. "In Iskandar Malaysia we have found a new territory to display our development prowess, and we promise to deliver quality in our work," BSEL managing director Dharmendra Raichura said. He added that the anticipated development plan, involving 70 million sq ft, will be completed in three phases. The RM15 billion investment comprises RM2 billion in the first phase, followed by RM4 billion and RM9 billion in the last two phases. In India, some of BSEL's best-known completed projects include the BSEL Tech Park Hilton Centre, Indian Institute of Technology and Kharghar Phase-1. Its ongoing projects include the Rajiv Gandhi IT Habitat, six shopping malls in Nagpur, and a hotel and commercial development in Pune. SHARM EL-SHEIKH (Egypt): Egyptian Resorts is negotiating two new projects on Egypt's Red Sea and studying another on the North coast to build on the country's growing tourism sector, chairman Ibrahim Kamel said. Kamel said in an interview late on Saturday that his company was talking with Rowad Tourism (Al Rowad) to develop a 4 million sq m piece of land in Dahab and had applied to develop land in Ras Benas, also on the Red Sea. "The two deals could be concluded soon and will be totally financed from the company's excess liquidity," he said. The firm has extensive land holdings on the Red Sea coast and reported a 21 percent rise in net profit before minority interests to US$53.22 million (US$1 = RM3.25) in 2007. "Egypt is to be one of the world's most attractive tourist destinations and we have to be ready for that," Kamel said. LONDON: British Land Co plc is in talks to sell the Willis Building in London to the Kuwait Investment Authority for as much as STG400 million (STG1 = RM6.34), the Financial Times reported at the weekend. A sale of the landmark Foster & Partners-designed office building opposite Lloyd's of London would be one of the biggest property deals since the start of the credit crunch and is likely to be welcomed by British Land's shareholders. The newspaper said talks were at a "late-stage" and the deal was being carried out by St Martins, the property arm of the Kuwait sovereign wealth fund. British Land was not available for immediate comment. The last big deal in the UK was the sale of control of the ExCeL London conference and exhibition centre to state-owned Abu Dhabi National Exhibitions Co for more than US$600 million (US$1 = RM3.27) earlier this month. Buying and selling of British commercial property has slumped due to the credit crunch, which has slashed 17 per cent off average capital values as debt dependent property investors have vanished, leaving the field open to cash rich players such as German open ended funds and Middle Eastern investors. British Land is expected to show significant falls in net asset value due to the downturn in the property market when it reports full-year results on Wednesday. The Willis Building was given a price of STG360 million in British Land's 2007 results and despite falls in the wider market, its value is seen as broadly the same yesterday, the Financial Times said. PETALING JAYA: A property downcycle in terms of slower take-up rates may affect the outlook for Eastern & Oriental Bhd (E&O). In a research report, Kenanga Investment Bank said the regional property scene had “cooled slightly” due to local political uncertainties and the grim outlook for global economies. “Nevertheless, we remain upbeat on E&O’s projects as they are in prime areas and can leverage on their strong branding. Additionally, the group has achieved high take-up rates for its ongoing projects, which mean earnings are secured for at least two more years,” the Kenanga report said. The research house added that brand power was the driver of E&O’s corporate goals to create strong sustainable income in the long term. “E&O believes that branding is critical for strong sustainable growth, especially when targeting discerning high-end home buyers,'' it said. “The group has identified niche markets and produced high-quality innovative products at the same time to achieve high take-up rate before completions,” it added. E&O has aggressively marketed its properties overseas and has taken advantage of “Malaysia, My Second Home” as well as other property incentives to attract foreign buyers. The company, which is on a continual lookout for prime land in the Klang Valley, Penang and Johor, would be more cautious in acquiring land due to the soaring prices for such land. Kenanga said the company's margins should be able to buffer it against rising material costs. It added that E&O was making a “fat enough a margin” for its property projects. Kenanga initiated a “buy” call on E&O with a target price of RM3.54. Standard & Poor's Equity Research (S&P) said E&O's earnings for the financial year ending March 31, 2009 would be driven by its property development arm while its hospitality and lifestyle division would provide income flow in addition to strengthening the E&O brand. S&P said in a research report that in the longer term, E&O aspired to enjoy higher recurring income from its property investment division, which had targeted a portfolio of RM1bil worth of properties over the next five years.